Stock your clinic with these educational, tri-fold brochures to inform your clients about animal acupuncture and chiropractic. 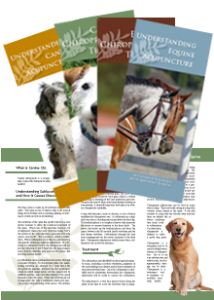 Each brochure covers acupuncture / chiropractic basics and their applications in dogs and horses. Includes room on the back for a doctor’s picture and bibliography, clinic stamp or mailing sticker.